Amanda and Chris’s wedding vibe? As relaxed as can be. These two have people over at their home all the time and wanted their celebration to have the same easygoing, we-are-all-family feel. That philosophy extended not just to the décor but to their guests, too. Amanda fervently believes “people are happiest when they are able to be comfortable with who they are.” So, when asked by friends and family what to wear or whether they should shave for the wedding, all she did was encourage them to be themselves! 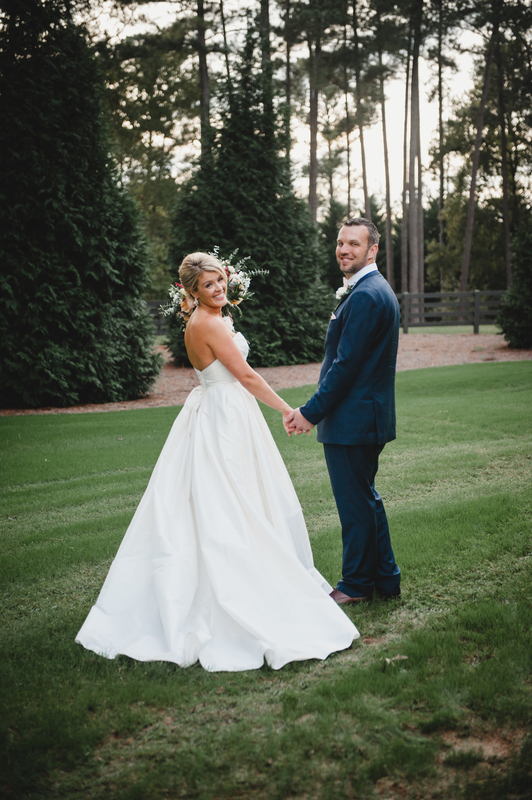 “I started looking on Pinterest for gowns that matched the look/feel I was trying to achieve. I found one I was obsessed with and traveled to Richmond, Virginia to go check it out. Because it was my first shop, I told the owner I still wanted to look around but that I thought I’d be back. “Chris and I have people over to our house all of the time and I really like the relaxed vibe we have with our friends and family. When it came to our wedding, we didn’t want anyone to feel like they couldn’t be themselves. We got a ton of friends asking “do I need to shave, what should I wear?” and I truly believe that people are happiest when they are able to be comfortable with who they are. What is your funniest wedding day memory? “Oh gosh!! Our wedding morning was definitely the funniest (now!) part of the day. It was kind of a series of disasters that all came together in the most perfect way. My wedding coordinator got the flu a few days before the wedding, it went from a light drizzle to a full-on downpour while the vendors were setting up and the AMAZING team one of my bridesmaids called in to help when the coordinator couldn’t was running 2 hours behind due to the weather. My sister (also MOH) went with me to the venue to see what we could try and help with. We were trying to make the call to see whether or not we could still have the ceremony outdoors—mainly because the most expensive floral piece we had purchased was a 15-ft. greenery/flower display to go over the arbor that was part of the outdoor venue. I remember her saying “I think it’s going to lighten up” and it started DOWNPOURING. “Something blue: my mom had our wedding date, our names and “C” for Crawford embroidered in blue and we had it sewn into the rib-cage of my dress. Something old: This was the most special thing! Before my dad’s dad passed away, he gave him a few of his old handkerchiefs. My dad had his dad’s initials embroidered on one side, and my old/new initials and wedding date embroidered on another. My dress had pockets so that I could carry it and use it when I got teary-eyed on the big day! Something borrowed: My aunt let me borrow a family ring that perfectly matched the earrings and shoes I had picked out. “You only get to go through this process together once, so make sure to take it in and enjoy the planning! Spend time together and make decisions that both of you are going to be happy with. There’s a lot of pressure to do what your family and friends suggest—make sure you don’t get so caught up in pleasing them that you lose what’s important to both of you in the process. Try to delegate as much stuff that needs to be done about a month before the wedding to your closest friends and family. RSVPs will get lost in the mail—having a few friends who can check in with your guest list will save a lot of time when you are getting your head counts together. Stunning Wedding!!! From beginning to end just FABULOUS!! !